Abstract: This will be a hands-on workshop on Probabilistic Graphical Models using PGMPY library. Attendees shall learn about basics of PGMs with the open source library, pgmpy for which we are contributors. PGMs are generative models that are extremely useful to model various hierarchical and non-hierarchical models as well as stochastic processes. We shall talk about how fraud models, credit risk models can be built using Bayesian Networks. We shall also talk about Hidden Markov Models and showcase how thermostat control can be modeled. Generative models are also useful to measure causality and are great alternatives to deep neural networks, latter which, cannot solve such problems.. This workshop shall have students learn basics needed to learn about Bayesian Networks, Markov Models, HMMs including advanced probability and other math basics needed to understand the topic. Students shall learn by examples through this workshop. at the BBN Technologies in the area of Bayesian Machine Learning algorithms as applied to Speech Recognition. He has more than 15 years of experience in the areas of Artificial Intelligence (AI), Digital Signal Processing and Software development. He has several publications and patents filed in the areas of ML. He has led various Data Analytics projects across US and Europe that led to organizational savings of $8M+. He has built out the curriculum for Machine Learning training platform, refactored.ai which is now part of SUNY Buffalo’s graduate ML course. 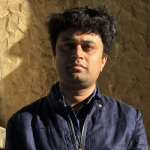 He is currently the founder of Mysuru Consulting Group (MCG.ai) and Diagram.AI where he works on ML algorithms.